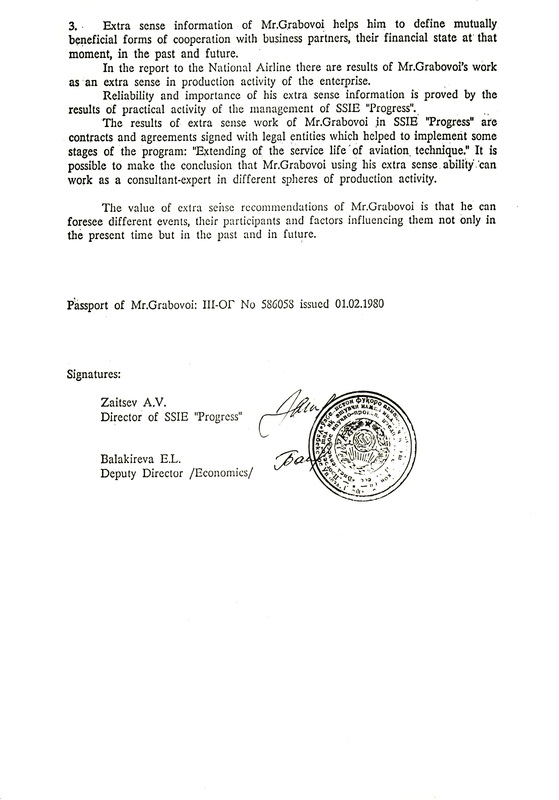 This is to certify that Mr.Grabovoi Grigori Pctrovich worked at State Scientific Industrial Enterprise “Progress” from 10 June 1991 till 10 June 1993 under the contract with Civil Aviation Administration of Uzbekistan and then with National Airline “Uzbekistan Airways” of the Republic of Uzbekistan. During this period Mr.Grabovoi using his extra sense abilities participated in the study of all organisational activities of SSIE “Progress” connected with the main problem – “Extending of the service life of aviation equipment”. According to Mr.Sumbaev, Deputy Director General, this is the most complicated problem under the circumstances in Uzbekistan. The Board of Directors of SSIE “Progress” suggested Mr.Grabovoi working at this problem ‘ using his extra sense information for making recommendations concerning the most important economic, financial, organisational and technical problems. In the process of discussion problems and methods of their settlement Mr.Grabovoi made recommendations based on his extra sense information, using different factors influencing their settlement: psychological, economic, political and ‘others. His recommendations were always precise and well grounded and were used for implementation. By the order of the Director of SSIE “Progress” he gave characteristics to business partners he never knew and never met before. At that moment they could be many kilometers away but his information was always correct. Using his ability Mr.Grabovoi can describe a person he never saw, he can name some of his habits, state of his health, nationality and other details. Using his extra sense information Mr.Grabovoi formulates the causes and factors of the problems of the production process, makes recommendations for conducting business talks, advises how to act in extraordinary situations and makes many other recommendations. Extra sense information of Mr.Grabovoi helps him to define mutually beneficial forms of cooperation with business partners, their financial state at that moment, in the past and future. In the report to the National Airline there are results of Mr.Grabovoi’s work as an extra sense in production activity of the enterprise. Reliability and importance of his extra sense information is proved by the results of practical activity of the management of SSIE “Progress”. 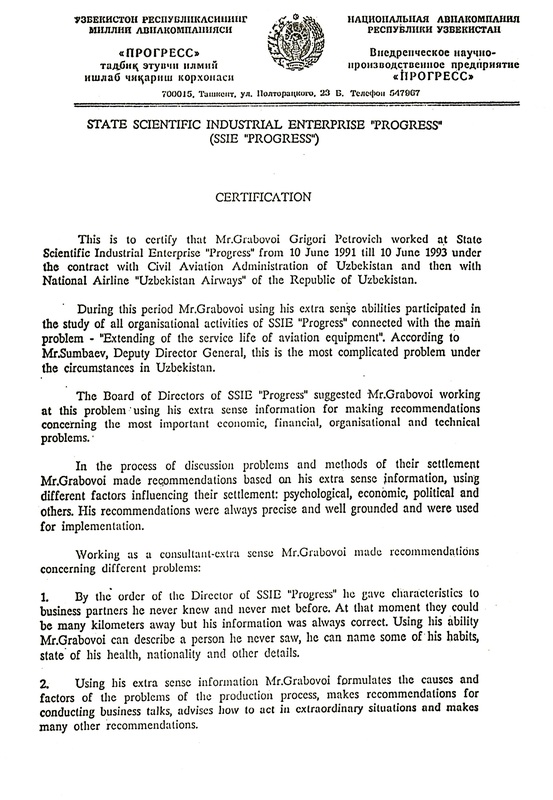 The results of extra sense work of Mr.Grabovoi in SSIE “Progress” are contracts and agreements signed with legal entities which helped to implement some stages of the program: “Extending of the service life of aviation, technique.” It is possible’to make the conclusion that Mr.Grabovoi using his extra sense ability .’can work as a consultant-expert in different spheres of production activity. The value of extra sense recommendations of Mr.Grabovoi is that he can foresee different events, their participants and factors influencing them not only in the present time but in the past and in future.